Amalia Stemless Red Wine - Clear - 4"H - 18oz. Wine with friends with cheese! Amalia Tall Champagne Flute - Clear - 15.5"H - 10oz. 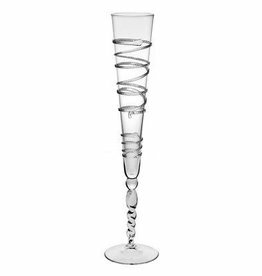 From Juliska's Amalia Collection - svelte, threaded swirl ascends our Amalia martini glass adding a seductive twist to your ice cold cocktail. Amalia Martini Glass - Clear - 5"W x 7"H - 6oz. Amalia Stemless White Wine - Clear - 4.5"H - 14oz. From Juliska's Amalia Collection - Clink! this sparkling glass flute was designed to celebrate! Like bubbles ascending from your champagne, a delicate thread of swirling glass climbs the stem to add an effervescent elegance to your celebration.